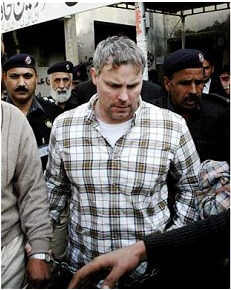 Raymond Davis, the former Special Forces operative and current CIA contractor, who stands accused of “murdering” two Pakistanis in Lahore, was arraigned today on those charges. Mr. Davis appeared before a Pakistani judge and refused to sign an affidavit outlining the charges against him, saying that he had full diplomatic immunity and that the charges against him were therefore moot. US sources tell US news organisations that Mr. Davis was serving in Lahore, Pakistan as a bodyguard for CIA officials in Pakistan. He was previously employed by Blackwater, the US military/intelligence sub-contractor. The US government is insisting that Mr. Davis’s diplomatic status be recognised immediately. Top US military commanders met with their Pakistani counterparts in Oman Tuesday to press Davis’s case. Pakistani officials are afraid that if they release Mr. Davis, the streets of Lahore and Islamabad will erupt with violence.